On this day, 66 years ago, baseball lost a true D-Day hero. 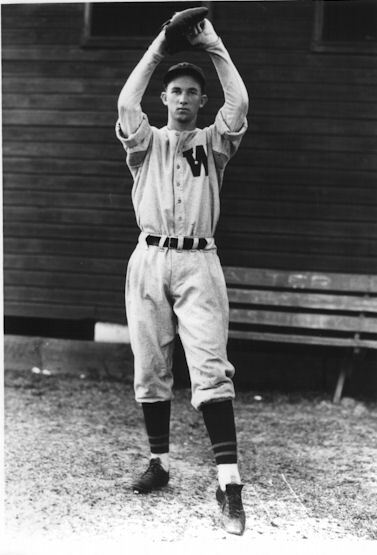 Lefty Brewer, owned by the Washington Senators, died fighting for his country more than 3,000 miles from home. Francis Field, home of the St. Augustine Saints of the Florida State League, was a magical place during the summer of 1938. As the smell of roasted peanuts filled the air, accompanied by the rhythmical sounds of soda bottles banging against wooden bleachers during late inning home team rallies, Lefty Brewer, the Saintsâ€™ rookie sensation, unleashed a season of blistering fastballs on his way to an outstanding 25 victories. 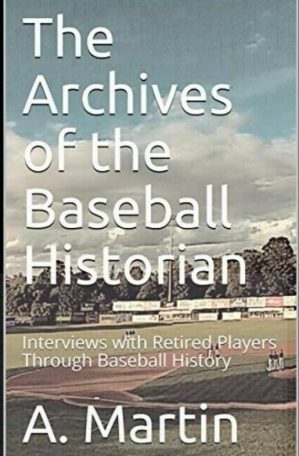 Iâ€™ve spent around 15 years studying WWII-era baseball. Back in 1995, I knew some minor league players had been killed although I didnâ€™t know how many. Lefty Brewer was among the first I was aware of. His story intrigued me from the start; a 25-game winning rookie pitcher who becomes an elite paratrooper, plays his last ever baseball game right here in Britain and tragically loses his life on D-Day. It certainly had the makings of a fascinating story but I had no idea back then that Lefty would become an important part of my life. 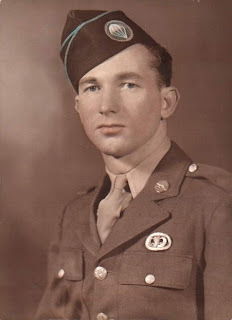 Since learning about Lefty I have communicated with his dear brother William, and many of his paratrooper buddies including the late Bill Dean, who was with him the moment he was killed. Of the 133 professional baseball players who died during WWII, I know Lefty better than any of them. I know he was a guy who seemed to attract trouble even if he didnâ€™t go looking for it. He was an outstanding athlete who, with the right guidance, could have become a great major league pitcher. I know he had a wonderful sense of humor and I know he was a natural leader of men. He has also given me an insight into a time when patriotism was commonplace and few questioned the rightness of the cause for which they were fighting. Leftyâ€™s time in combat was limited but Iâ€™m sure he gave the Nazis hell. So, today, on the 66th anniversary of D-Day and his untimely death, I say thank you to my hero â€“ Lefty Brewer. Forrest â€œLeftyâ€ Brewer was born in Sequatchie, Tennessee, about 30 miles northwest of Chattanooga. The Brewers were a nomadic family – relocation was to become a familiar thing – and in 1924, parents Frank and Mattie Brewer loaded up the family Dodge with five-year-old Forrest and his siblings – Vera, Frank, Jr., Kate and William – along with their scant few possessions and left the green rolling hills of the beautiful Sequatchie Valley, moving 600 miles south to Orange City, Florida. As it was for many during the Depression, times were tough for the Brewers. Food and jobs were hard to come by and they were an impoverished family, moving from town to town, and slum to slum, where street brawls were commonplace and electricity was not. Frank Brewer, a man too fond of alcohol, ran a succession of unsuccessful grocery stores. When the business invariably failed, the family moved on and his wife, Mattie, eventually became the breadwinner, operating a boarding house for railroad workers from the Seaboard Air Line Railroad in the rundown Lackawanna neighborhood of Jacksonville, Florida. The Brewer children, nonetheless, were impervious to their hardships. For the barefoot boys, their days were spent hunting rabbits and squirrels, and fishing for copperhead bream, bass and catfish. On one occasion, Forrest stole a watermelon from a neighborâ€™s yard. He was soon caught and the neighbor made such a fuss that, for a time, William thought his brother was going to jail. Another time, a neighbor was painting an old washing machine and warned the Brewer boys not to touch it. Like a red flag to a bull, Forrest could not resist and left fingerprints all over the wet paint resulting in the neighbor chasing Forrest, with paint brush in hand, all the way down the street. Sports were a big part of the Brewer boysâ€™ lives. Nearby Lackawanna Park provided a swimming pool, basketball court, horseshoe pits and football field encompassed by a running track. Forrest – or Lefty as he was known to everyone – was the gifted athlete of the family. He was coordinated, fast and agile, and the best player in neighborhood sandlot ballgames that were played with toe sack bases and home plates made out of tin. Brewer went on to became a stellar pitcher with the Robert E. Lee High School team, and out of school, at the ballfield near the city incinerator, he fine-tuned his pitching skills with the Smithâ€™s Service Station and Collins Department Store teams in the City League. He also played softball and pitched for the Atlantic Coast Line Railroad team where he worked after dropping out of school. In the spring of 1938, 19-year-old Brewer – along with infielder Faulene Kirkland, who also played for Smithâ€™s Service Station – attended a baseball training school conducted by veteran minor leaguer turned scout John â€œPokeâ€ Whalen, and general manager of the Florida Coast Leagueâ€™s St. Augustine Saints, Fred Hering. They needed just one look at Brewerâ€™s deceptive yet smooth delivery, his overpowering fastball and hard-breaking curve before offering him a contract with the Class D Saints. Under the watchful eye of veteran catcher Allen Mobley and player-manager and former major leaguer Lyle Judy, Brewer turned in a truly memorable rookie performance. That night, Brewer was carried from the field on the shoulders of his teammates after beating the Orlando Senators, 3â€“0. With Charles Wrenn behind the plate, he walked one and struck out 14 in achieving the Florida State Leagueâ€™s only no-hitter that year. Pierce Evans was 14 years old in 1938. â€œThere were basically only three things to do for entertainment in St. Augustine,â€ he recalls. â€œWe had the movies, radio and baseball. 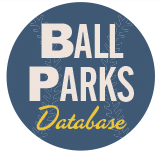 We played baseball, we watched it, and we had our share of local baseball heroes. Lefty Brewer was one of them. Despite Brewerâ€™s 25 wins, another 16 contributed by Carl Weigle and seven from future major leaguer Lou Thuman, the St. Augustine Saints finished the season in fifth place with a 70â€“70 record and no hope of a playoff position. Nevertheless, news of the young left-handerâ€™s heroics spread fast. The Saints were owned at the time by Joe Cambria, a well-known figure in professional baseball who had a strong alliance with Clark Griffith, owner of the American Leagueâ€™s Washington Senators. 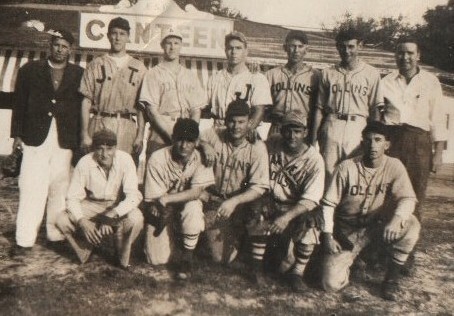 On Cambriaâ€™s trusted recommendation, Griffith purchased Brewerâ€™s contract at the end of the Florida State League season and invited him to the capital city for the final weeks of the Senatorsâ€™ 1938 campaign. Although Washington was a perennial second division team, Brewer got to see major league baseball for the first time and outstanding big league talent such as the great Dutch Leonard, Al Simmons, Cecil Travis, Buddy Myer, Buddy Lewis and the Ferrell brothers, Wes and Rick. When Brewer returned home to Jacksonville in October, he had saved enough money not to have to work and spent much of his time hunting and fishing, and occasionally pitching games for local semi-pro teams. In a United Press article by Paul Scheffels in February 1939, Brewer was listed among the Senatorsâ€™ rookie hopefuls for the coming season along with Walt Masterson, Bucky Jacobs, Joe Haynes, Bob Overstreet, Red Anderson, Mickey Vernon and Bobby Estalella, and he was among 20 young rookies attending an early workout with the Washington Senators in Orlando, Florida that month. The Senators recognized that Brewer needed further seasoning and he was released to the Charlotte Hornets of the Class B Piedmont League in March. 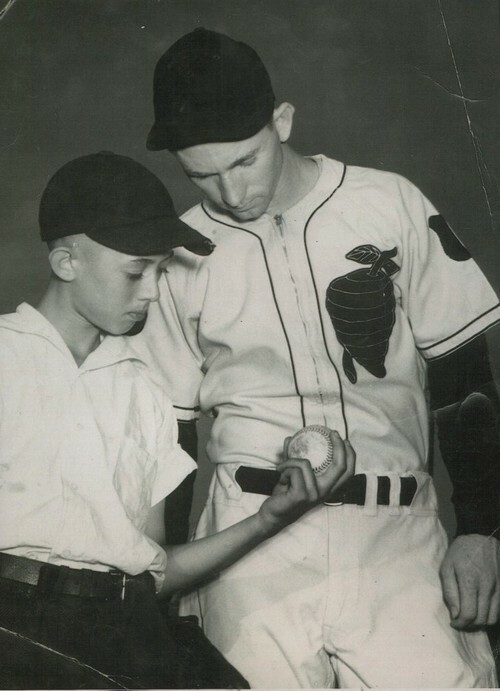 After pitching just three games and suffering two defeats, manager Cal Griffith felt the 20-year-old was not ready for Class B ball and released him to the Shelby Nationals of the Class D Tar Heel League. His sophomore year was to be plagued with arm problems, probably because of overuse the previous season and Brewer was not the only pitcher who hurled in the Florida State League during 1938 and failed in 1939. Jack Gady, who posted a record of 16-11 in 278 innings for Palatka, could only produce a 1-9 record and 5.97 ERA in 1939. While, Harold Conn, who was 16-19 for Orlando pitching 275 innings, dropped to 10-13 with an inflated 5.94 ERA in the Mountain State League in 1939. Five wins in 19 appearances with Shelby and an ERA of 5.25 triggered a return to the Florida State League on May 6. Toiling for the Orlando Senators – against whom he threw his no-hitter the previous year – Brewer recorded seven wins with 11 losses and a 3.85 ERA. 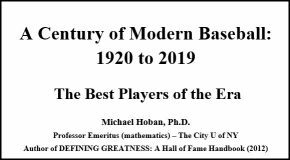 In 1940, Brewer was back with the Charlotte Hornets, and as Hitlerâ€™s blitzkrieg swept through Europe at an alarming rate, he turned in a steady performance, quickly becoming a fan favorite at Hayman Park. On a team that lacked offense and finished fifth, he won 11 games against nine losses. On May 11, he defeated the Durham Bulls, 2â€“1. On July 9, he defeated the Norfolk Tars, 4â€“2, on five hits, and on July 20, he beat the Rocky Mount Red Sox, 3â€“2, holding them to four hits. In August, the Hornets made a run for fourth place and a position in the playoffs. Brewer responded by pitching his best game of the year on August 25, defeating Norfolk, 1â€“0, and allowing just two hits. While Charlotte failed to make the playoffs, Brewerâ€™s pitching again caught the eye of Clark Griffith who invited him back to Washington in September. Following President Rooseveltâ€™s signing of the Selective Training and Service Act in September 1940, the Charlotte Observer announced that 10 Hornet players were eligible for the first wave of conscription, including Brewer. On March 4, 1941 – one week before reporting to the Senatorsâ€™ spring training camp – he entered military service with the Army at Camp Blanding, Florida. At the age of 22, and on the verge of a major league career (he was carried on the Washington Senatorsâ€™ National Defense Service List), he swapped flannels for service fatigues and reported for basic training. Brewer was at Camp Blanding with the 31st â€œDixieâ€ Infantry Division until volunteering to serve with the paratroopers in January 1942. He was enticed, perhaps, by their elitism, but certainly by the extra $50 a month hazardous-duty bonus. 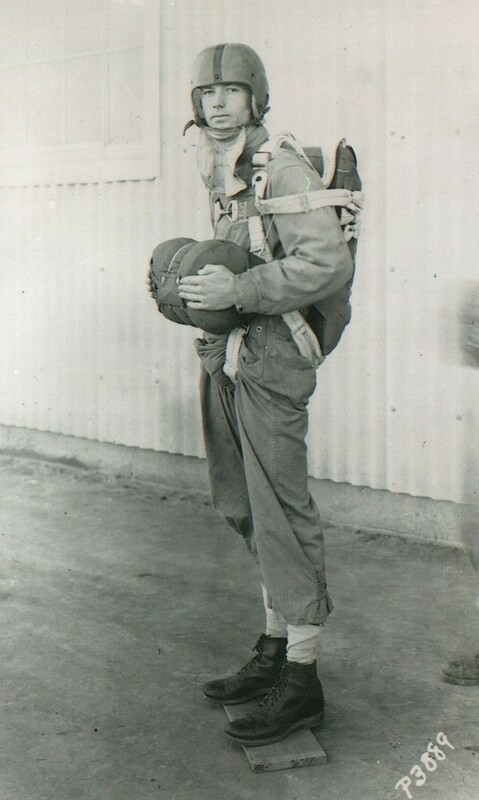 Brewer attended Parachute Jump School at Fort Benning, Georgia, and after two weeks of preliminary training, the first jumps were made from 35-foot towers by dropping down on a pulley into a pit of sawdust. Once that technique was mastered, they moved on to the 250-foot towers, where they were attached to a static line and would drop by parachute. The next step was to jump from an airplane and after five jumps Brewer earned the coveted silver wings of a paratrooper. The two brothers had no idea their furloughs coincided, and arrived together at their parentâ€™s home, where they were met with looks of shock and elation. It was a wonderful, if short-lived, reunion. A local girl named Mary Dixon was another reason for Brewer wanting to stay home. They had been dating for some time, and during the summer of 1942, they got married at the small town of Macclenny, west of Jacksonville. In April 1943, the 508th PIR relocated to Camp Mackall – at the time, it was merely a name assigned to a few buildings and upturned soil between Pinehurst and Rockingham in North Carolina. Camp Mackall, however, was to become a marvel of wartime construction. Within four months, 62,000 acres of wilderness had 65 miles of paved roads, a 1,200-bed hospital, five movie theaters, a complete all-weather airfield and 1,750 buildings. Training was vigorous for the paratroopers at Camp Mackall. They made day and night jumps as the 508th PIR was developed into a smooth functioning unit. On one occasion, as Brewer was about to board a plane for a practice jump, he thought he recognized the pilot. Upon closer inspection, he discovered it was the Senators former third baseman Buddy Lewis. 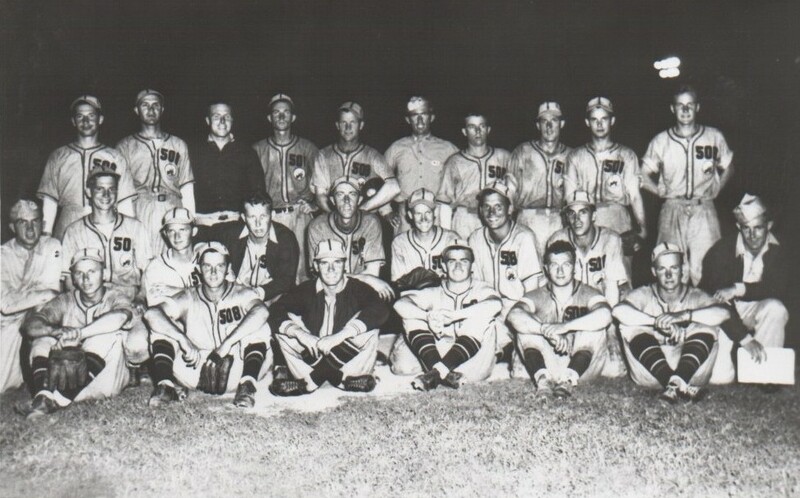 The 508th Red Devils baseball team had a 26â€“4 won-loss record in 1943, and clinched the Camp Mackall championship by defeating the 135th Quartermaster Company in the league playoffs. Shortly afterwards, a regimental order disbanded the team because it was felt that further play would result in the loss of valuable military training for the men. Had the season continued, it is likely that the Red Devils would have attained national prominence as games had been scheduled against the North Carolina Pre-Flight Cloudbusters and the mighty Norfolk Naval Training Station. On Sunday, May 28, 1944, the 508th Red Devils baseball team unexpectedly reformed for their final game before going into combat. Speculation still hangs over the reason this game was staged. The â€œofficialâ€ story at the time was that the Nottingham Anglo-American Committee requested the Americans to stage a sporting event because the people of Nottingham had for years been void of entertainment. However, because the game was arranged by Brigadier General James M. â€œJumpinâ€™ Jimâ€ Gavin, commander of the 82nd Airborne Division, many believe the game was designed to fool the Germans. If American paratroopers were playing baseball in England, how could an invasion be imminent? 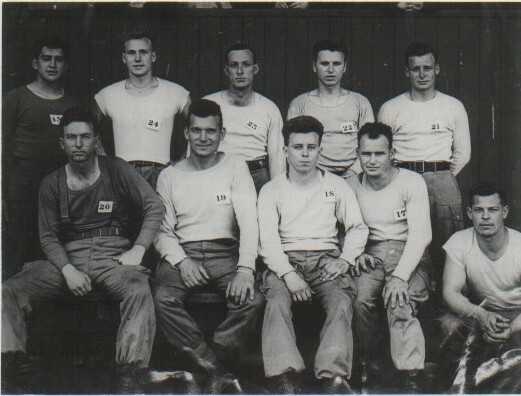 The 508th Parachute Infantry Regiment baseball team at Nottingham, England on May 28, 1944. Lefty Brewer is front row, first left. There had been a noticeable absence of paratroopers in the stands at the game. Having been such a familiar sight in Nottingham for the last couple of months, only officers and players were on hand. As the crowd cheered each crack of the bat, the rest of the regiment made a 40-mile journey to Folkingham Airfield where it was sealed in amidst tight security. Preparations for the invasion had begun. Folkingham, like many other airfields around England at the time, was a hive of activity. The runways were packed with Douglas C-47 transport planes adorned with black and white invasion stripes, and groups of paratroopers meticulously studied maps of the drop zones in Normandy. They packed equipment, cleaned rifles, played cards and shot dice in the hangar buildings, attended movies, wrote letters to loved ones, and learned of their objective: to keep the Germans from reinforcing troops that were defending the beaches. On June 4, they were ready to take off but the weather forced a delay. The following night, eight days after pitching for the Red Devils, Brewer and the men of the 508th – with their faces blackened and hearts racing – boarded C-47s for the flight across the English Channel. D-Day had begun and the paratroopers would spearhead the invasion. C-47s were stark inside. A row of hard metal bucket seats lined both sides of the plane and the roar of the engines drowned out any attempt at conversation as they trudged through the dark skies towards the Normandy coast. Once over the mainland of France the sky became illuminated with searchlights and deadly tracer bullets pierced the wings and fuselage of the unarmed and unarmored planes. Anti-aircraft fire exploded all around as they neared their drop zones at an altitude of 400 feet. When the red light over the door of the plane flashed on, everybody stood up and clamped themselves onto the cable that ran down ceiling of the plane. Amidst yells of â€œGo! Go! Go!â€ Brewer and 24,000 Allied paratroopers just like him descended through the darkness into chaos and confusion. Inexperienced pilots, hindered by obscuring cloud cover, had failed to locate the drop zones and the majority of the 508th PIR found themselves too far east and astride the flooded Merderet River with the enemy all around. A split second later, there was a burst of machine-gun fire and Brewer pitched forward, face down into the river. Exactly six years after pitching a no-hitter with the St. Augustine Saints, Lefty Brewerâ€™s life had abruptly and violently ended. Private Forrest Brewer was buried at the American Cemetery in Sainte-Mere-Eglise, along with four other members of the 508th baseball team slain in the battle for Normandy: Private First-Class Rene Croteau, Sergeant John Judefind, Corporal William Maloney and Private Elmer Mertz. When the war in Europe finally ended in May 1945, the 508th Parachute Infantry Regiment had been in combat in Holland, at the Battle of the Bulge and the Ruhr Valley. 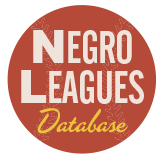 During the summer of 1945 the baseball team was reorganized for a series of games. Many familiar faces were missing and the once fresh-faced young men that remained now bore the emotional and physical scars of battle-hardened veterans. 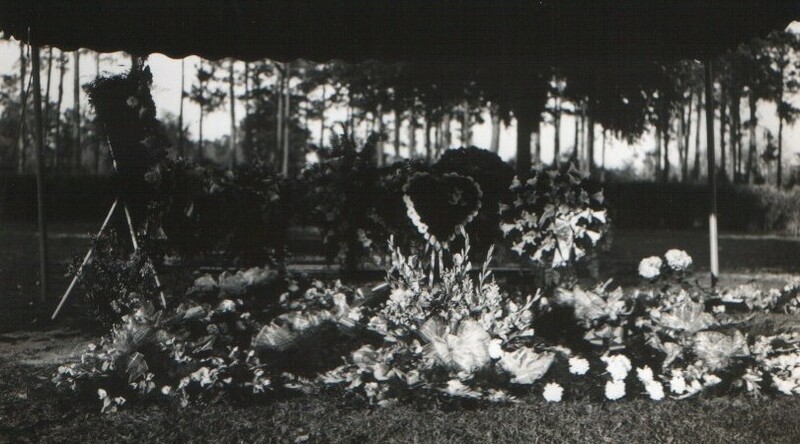 In 1947, at the request of the family, Brewerâ€™s body was returned home to Jacksonville, Florida. Following services at Key McCabe Funeral Homes, the flag-draped coffin was carried past the ballfield where he learned to pitch and was laid to rest at the Riverside Memorial Park Cemetery. Among the pallbearers were minor league ballplayers Ray Headon, Jones Thurmond and Saints teammate Faulene Kirkland.